This is the perfect tasty, healthy snack with superfood ingredients help you lose the baby weight, boost your energy, improve 'baby brain' AND help your babies health too. These healthy chocolate nut slices contain coconut oil; which is a very important nutrient for breastfeeding mothers. Coconut is found in breast milk but my eating more coconut products, nursing mothers can help improve the environment of the womb and improve the also increase the quantity in their breast milk to help their babies healthy development. Eating 40 grams (about 3 tablespoons) of coconut oil in one meal can temporarily increase the lauric acid in the milk of a nursing mother from 3.9% to 9.6% after 14 hours. This has a significant benefit as the protective antimicrobials lauric acid and capric acid found in coconut oil gives protection to the baby. By eating some coconut oil everyday, the mother gives greater protection to her babies health. Nursing mothers also need the right kind of fat in their diet, of which Coconut oil is an excellent source of good fat. It's is a medium chain fat as opposed to animal fat which is long chain and means it is easier for the body to break down. Long chain fat stores are harder to break down so they store more easily on our thighs and hips! Coconut oil is digested easily to provide your body energy and to help improve your metabolism encouraging weight loss and helping you burn fat faster. 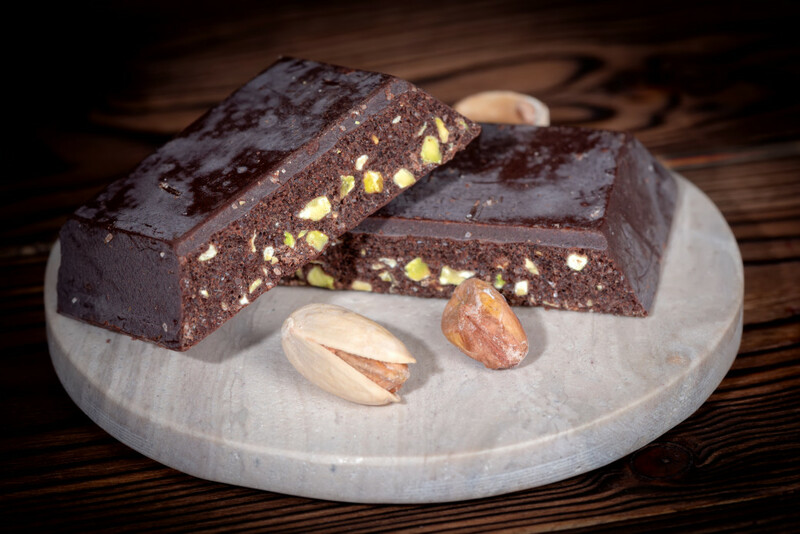 These chocolate nut slices will satisfy your sweet cravings whilst providing you with specific nutrients your body needs to deal with the tolls of pregnancy, recovering after having a baby and stepping into the world of being a parent! Preheat the oven to 180˚C or 370ºF. Grease and line a deep baking tray which is about 25 x 35cm in size. Add the almonds and pistachios to the lined baking tray and mix them up. Roast the nuts in the oven for 8 to 10 minutes until they lightly change colour and release their nutty smell. Do not allow them to burn or turn too brown. Remove from the oven and place to one side to cool down. Break the dark chocolate into pieces and place the pieces in a deep bowl which is a size that will sit on top of a saucepan. Place about 5 to 10cm of boiling water into the saucepan and place the bowl with chocolate on top of the pan. Make sure the boiling water does not touch the bottom of the dish. If it does empty some of the water out as this effects the consistency of the melted chocolate. Place on a low heat so the chocolate gradually melts. Once the chocolate is melted remove the bowl from the pan and add the coconut oil, butter, honey and/or maple syrup, cacao or cocoa powder. Place back on top of the saucepan and gradually melt again over a medium heat (this will only take about a minute). Remove from the heat and mix well so all the ingredients are combined. Place the chopped dates, raisins and nuts into a bowl and mix together. Then transfer these ingredients into the baking tray and smooth over so they are in a single layer. Pour the chocolate mix evenly over the top of the nuts, raisin and date mixture and place in the fridge or freezer to set. Once set, cut into smallish pieces and store in an airtight container. Health, body and beauty benefits..for pregnant, nursing mothers and mothers! Coconut oil provides pregnant women and new mothers with a vital combination of vitamins, minerals and nutrients which are so good for their babies. Many infant formulas in fact contain coconut oil. This oil contains lots of lauric acid, which is also found in breast milk and has powerful antiviral and antibacterial properties to boost the growing fetus and babies immune system to help ward off illnesses and serious viruses and protect them from harmful bacteria. By eating coconut oil mothers to be and new mothers can help improve the environment of the womb and also increase the quantity in their breast milk to help their babies healthy development. Other bonuses of coconut oil are that it helps replenish the nutrients your baby has taken from your brain (via the placenta) for the growth and development of its own brain. This little snack will help you think clearer and boost your memory again. Almonds contain vitamin E, to help strengthen the cells in your body and to help condition your skin and prevent wrinkles (great for when you think you look exhausted). Vicky Warr is a certified pregnancy and postpartum fitness specialist and founder of Bump and Beyond (formerly the Beez Kneez) digital fitness for a fit and healthy motherhood. Vicky is also a speaker and contributor to Gurgle Magazine, one of the leading baby publications in the UK and a mother of 2 children. Her exercise method has medical endorsement from Doctors and Women's Health Physiotherapists.